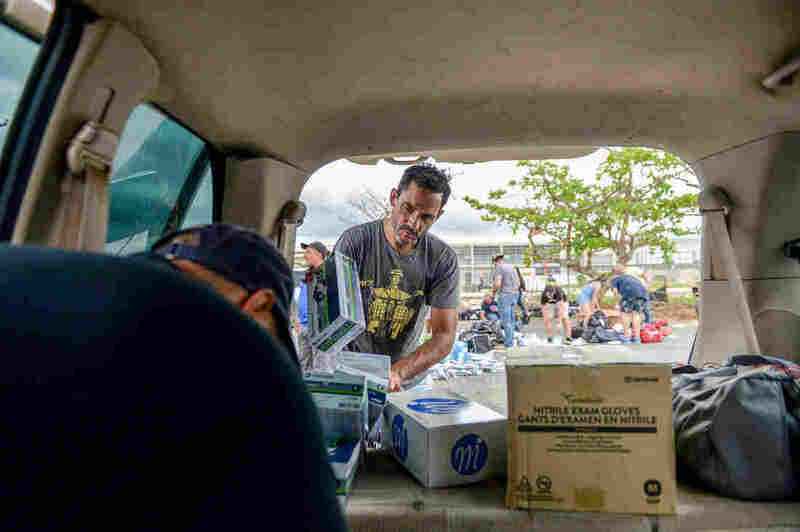 2 Strangers, A 6-Page List And A Plan Hatched To Help Puerto Rico They had never met, but quickly came up with a plan to get medical supplies to a town desperately in need. 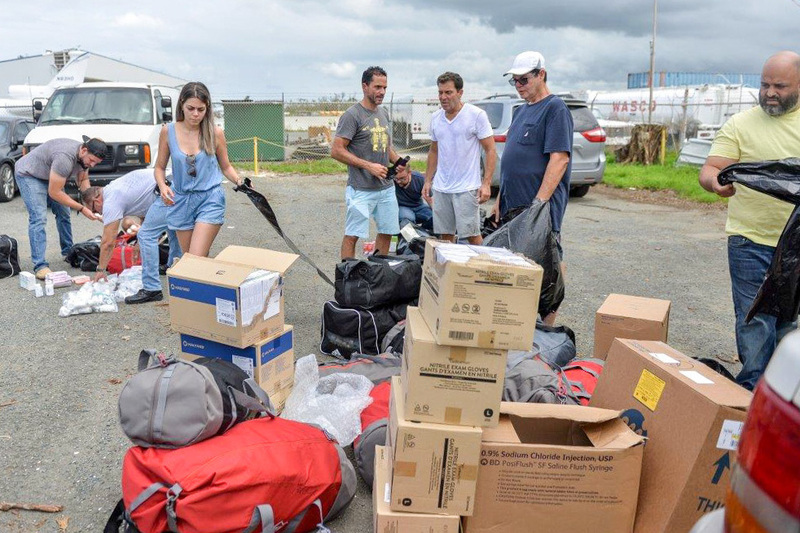 Together, José Ortíz (center left) and Ethan Leder (center right) — without the help of any major agency or aid organization — chartered a plane to Puerto Rico filled with donated medical supplies and get people with acute medical needs out of the island for treatment in the continental U.S.
Leder, meanwhile, has no connection to the island. But he followed the news of the hurricane, especially that "there was and there is a massive shortage of supplies and medicines" and a logjam on supplies in general. Leder is a health care business entrepreneur in Bethesda, Maryland; he's the founder and CEO of "Precision for Medicine Group," a company that develops targeted medicines. He describes himself as pragmatic. Various donated medical supplies that were chartered to Puerto Rico. 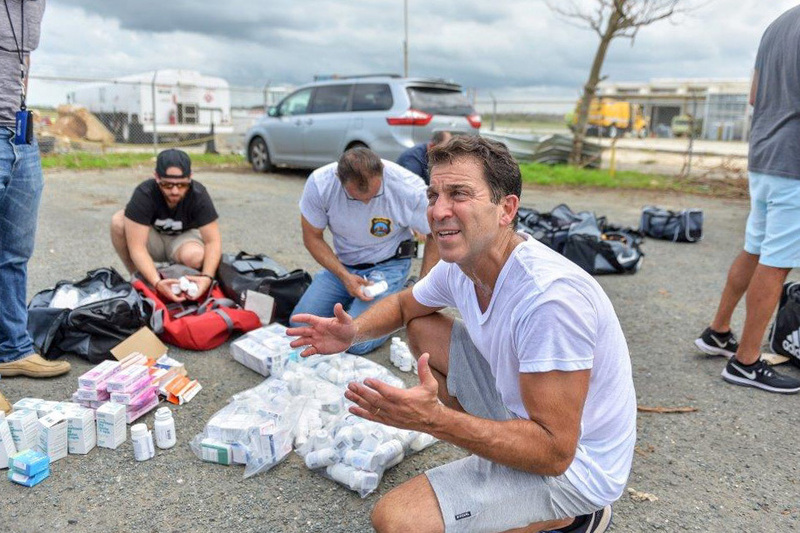 Together, Ortíz and Leder — without the help of any major agency or aid organization — managed to charter a plane to the island filled with donated medical supplies and get people with acute medical needs out of the island for treatment in the continental U.S.
Puerto Ricans living on the U.S. mainland are desperately trying to figure out how to best help their relatives back home. The island's population is 3.4 million and there are even more — about 5 million — Puerto Ricans living elsewhere in the United States. Since Hurricane Maria hit many organizations like Unidos for Puerto Rico, AmeriCares and the Red Cross are organizing relief efforts, but many Puerto Ricans and other Americans are finding more direct ways to send help to the island. The entire island's power was knocked out by the storm and nearly a month after the hurricane hit only 15 percent of people have power and fewer than 60 percent have mobile phone service now though the signal isn't too reliable. The shortage of electricity is creating profound problems in Puerto Rico — from no access to cash at ATMs to shortages of ice and lack of internet, but hospitals are the most challenged on the island. "I was just thinking 'why are they not able to get ships, massive floating hospitals quickly in to help'" to Puerto Rico, Leder says. As all those thoughts were running through his head, he says "I'm getting frustrated ... I got to do something, this is crazy." Ethan Leder is the founder and CEO of Precision Medicine Group, a company that develops targeted medicines. He has no connection to Puerto Rico but saw that there was a logjam on supplies and wanted to help. Leder called the head of a large relief organization – he didn't want to name which one — to seek out guidance on how to help and left a message. Then he called the only Puerto Rican he knows, the parent of one of his son's classmates. That parent connected Leder to Ortíz on a phone call that same night — eight days after Maria hit the island. "We just started really focusing on what we could do that needed to be done," says Leder. "We talked and texted about 50 times a day since." The two complement each other. Ortíz is a native Spanish-speaker and knows the island's culture and geography. He's focused and determined. Leder has never been to the island — he's trained as a lawyer and has connections in medical circles. "I sent out an email to all my contacts and I said, 'look guys, I'll fly to Puerto Rico next week. Here's a list of what's needed.'" 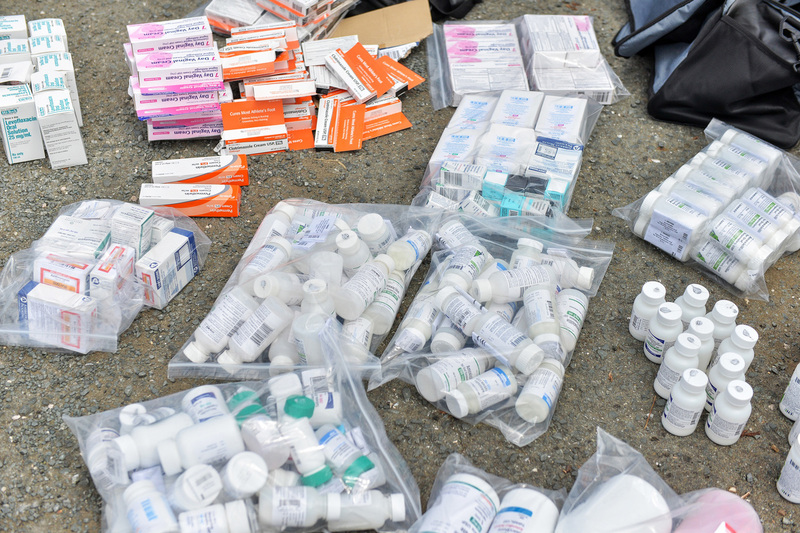 Lo and behold, says Leder, donations starting to pour in — anything from insulin, diabetes test strips, antibiotics, test drips, anesthesia, pepto bismol, ensure, antibiotics, steroids, wound kits and gauze; they also secured two generators, repellent and purifying water drops. Leder and Ortíz made their first trip earlier this month on October 3. Leder put the almost $75,000 cost of the charter flight on his credit card. Ortíz, a marathon runner with a piercing gaze and soft voice, describes his partner in this endeavor as an "angel." After the two spoke on the phone for the first time, Ortíz knew things would work out, he says. "The universe put us together at the perfect time." José Ortíz is a native Spanish-speaker and knows the island's culture and geography. One of Ortíz's assignments was to make contact with a city in need of hospital supplies. He focused on the western part of the island where he was born. "I know that the west part of the island was not being taken care of" he says, "that was my mission." Ortíz worked his phone and was able to reach Wilbert Ruíz, the assistant mayor of the nearby city of Aguada. The message was left on the city's 911 for emergency services. Ruíz says, "I couldn't believe it. José said they could deliver any medical supplies we needed." Ruíz wrote a six-page wish list, took a picture of it with his mobile phone and texted it to Ortíz. So instead of flying to San Juan, they landed in Aguadilla, on the western side of the island and the second largest international airport in Puerto Rico. 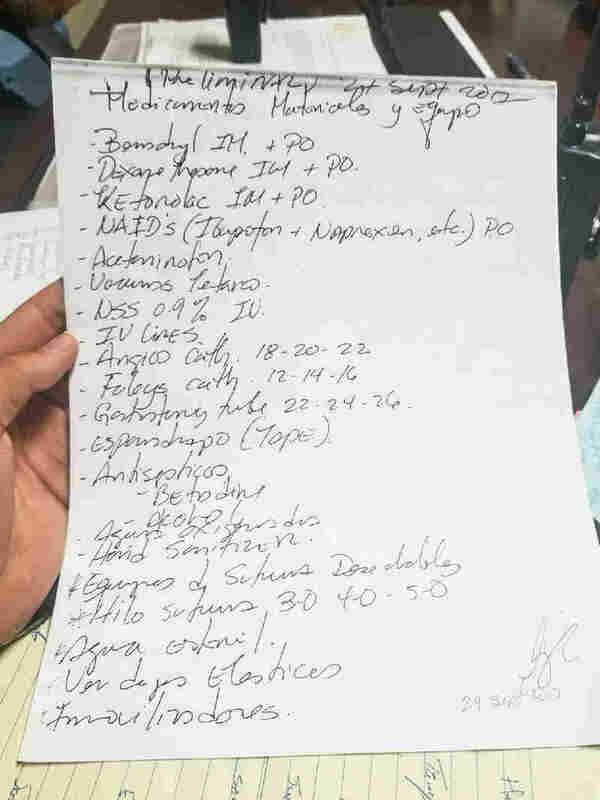 Page 1 of a 6-page long list of medical supplies that were requested by Wilbert Ruíz, the assistant mayor of Aguada. Wilbert Ruíz took care of the logistics at his end and waited for the flight on the tarmac. "Ethan and José's arrival felt like a movie," says Ruíz. Flights in and out of the island are still limited due to sheer mess left by hurricane Maria. The storm destroyed the local hospital in Aguada and the city set up a makeshift clinic in the church. "We have doctors working long hours with no pay, but for more than 10 days we didn't have medical supplies," says Ruíz, until Leder and Ortíz arrived. "It was like being in a battlefield without guns." "We are seeing between 50 and 75 patients a day" says Ruíz. Conditions include skin infection, diabetic-related issues, mental health, dehydration and stomach poisoning, but doctors are also stitching wounds. "Doctors are working hard to treat our patients here and to keep them out of hospitals," he says. Hospitals are overcrowded and lack air conditioning and patients' conditions can often worsen in those circumstances, Ruíz says. 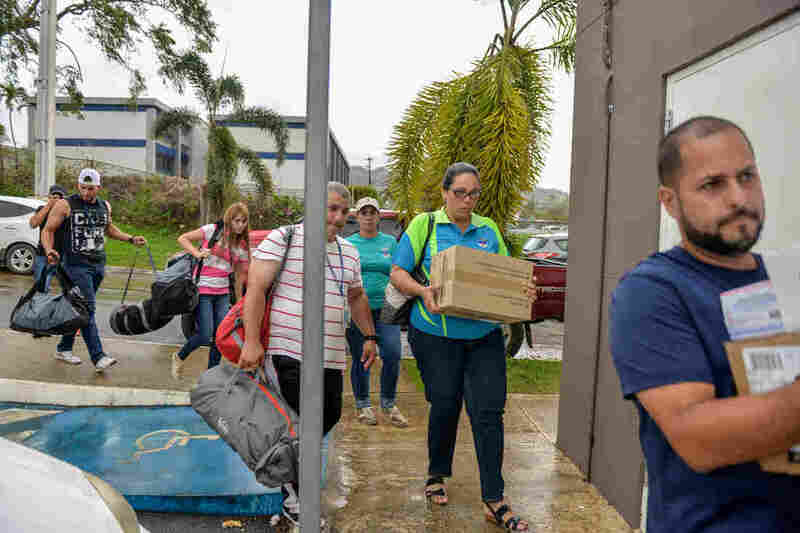 The Federal Emergency Management Agency has delivered food and water to Aguada, but medical assistance has not reached the area, except for civilian help from the mainland, says Ruíz. "I'm astounded by all the help" says Ruíz, "Ethan and José have a big heart. I don't know what we'd have done without them" and others on the mainland who have sent help too, he says. Remember that message Ethan Leder left for the large NGO asking guidance on how to help the island after Maria hit? "I received a response back the following week, after José and I had already done our first trip to the island," Leder recalls. Their response, he adds with a smile on his face, was one that is typical of what experts have been advising in the wake of the storm: "the best thing to do is to fund organizations already on the ground because it's impossible to get in and out of Puerto Rico right now." Volunteers helping transport medical supplies. Leder and Ortíz have also evacuated six people with medical needs to the mainland. Elizabeth Rodríguez Santana, 63, is one of them. She suffers from acute kidney failure and she's been on dialysis for nine years. Hurricane Maria shut down the clinic in Mayagüez where she received treatment three times a week, four hours a pop. There were no doctors at the clinic even when it reopened, says Rodríguez Santana. She says she went days without treatment and then she got an appointment two months out. While she's desperately trying to find treatment on the island, her daughter in Jacksonville, Fla. was desperately working the phones trying to get Rodríguez Santana evacuated to the mainland. Rodríguez Santana's daughter got her in touch with José Ortíz and Ethan Leder through friends and she was evacuated to Jacksonville on October 3. "I wasn't going to make it on the island" she says, her voice trembling with emotion. José Ortíz and Ethan Leder say they are friends for life now. They have made two trips to the island and have delivered medical supplies to the cities of Isabela, Moca, Las Marias, Maricao and Aguada. They say they are now standing by to go back to Puerto Rico "as many times as there's a need. It's not that hard," says Leder. Rodríguez Santana, who is now on the mainland, says she's eternally indebted to José and Ethan. "That flight was the gift of life."